Fuel cell technology has gained increasing acceptance as a clean and viable energy source. A recent report by the U.S. Department of Energy (DOE) highlights that worldwide fuel cell industry sales surpassed $1 billion for the first time in 2013, reaching $1.3 billion. The growing adoption of fuel cell systems both in developed and developing economies, particularly in transport and stationary applications, creates considerable growth prospects. According to Research and Market, the global market for fuel cells is forecasted to peg over $3 billion by 2020. Investments in R&D are crucial to bringing the fuel cell industry to its full potential. The present article will cover ongoing fuel cell innovation efforts and discuss the R&D tax credit opportunity available to support such initiatives. In addition to tax credits that can support fuel cell innovation, there are other governmental incentives to help minimize the costs of fuel cell investments. With the objective of fostering advances in fuel cell technology, the DOE’s Fuel Cell Technologies Office (FCTO) periodically selects research and development projects through open and competitive procurements and encourages partnerships among corporate, academic, and governmental agents. The office has recently made available up to $35 million in funding for R&D, demonstration, and deployment projects. The opportunity aims to accelerate the adoption of hydrogen and fuel cell technologies and help overcome key technical challenges involved. Target areas include low platinum group metals catalyst development and fuel cell-powered range extenders for light-duty hybrid electric vehicles. At the state level, there is a wide variety of incentives to hydrogen fuel cells, ranging from state tax credits to grants and rebates. The Department of Energy Database of State Incentives for Renewables and Efficiency (DSIRE) lists 93 incentive programs targeting fuel cells using renewable fuels currently available in 31 states. Examples include New York State Energy Research and Development Authority (NYSERDA)’s Customer-Sited Tier Fuel Cell Program, which supports the installation and operation of continuous duty fuel cell systems in New York State. The initiative offers up to $50,000 for fuel cell systems rated at 25 kW or less and up to $1 million for fuel cell systems rated larger than 25 kW. Funding is on a first-come, first-served basis until December 31, 2015, or until funds are exhausted. Fuel cells are electrochemical devices that convert chemical energy into electricity. This is made possible through the combination of a fuel (most commonly, hydrogen) and an oxidizing agent. In some ways, the functioning of fuel cells resembles that of a battery, which also uses chemical reaction to provide electricity. The difference lies in the fuel cells’ ability to maintain a constant supply of electricity as long as it receives a continuous provision of reactants. In other words, they do not run down or need recharging. Besides electricity, the chemical reactions involved in the power generation process have water and heat as their only byproducts. These can be used to provide hot air and water, enabling fuel cell systems to be used in combined heat and power solutions. 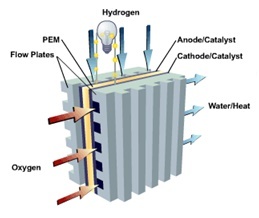 The accompanying diagram, created by the DOE’s Office of Energy Efficiency & Renewable Energy, illustrates how polymer electrolyte membrane (PEM) fuel cells work. One of the most common types of fuel cells, the PEM fuel cell consists of an electrolyte membrane sandwiched between a negative electrode (anode) and a positive electrode (cathode). Different from most energy sources, fuel cells have multiple potential applications, including stationary, transportation, material handling, portable, and emergency backup power applications. In addition to a variety of applications, fuel cell technology is also flexible in its scale. Fuel cell systems are equally capable of providing energy for hand-held electronic devices as to utility power stations. Fuel cells provide a unique combination of benefits. The electrochemical process eliminates the necessity of combustion, generating low-to-zero emissions of carbon dioxide. Even the fuel cells that use natural gas or hydrocarbons as a hydrogen feedstock produce far fewer emissions than conventional sources of energy. According to the non-profit organization Fuel Cells 2000, “a stationary fuel cell power plant using natural gas as a source of hydrogen creates less than one ounce of pollution per 1,000 kilowatt-hours of electricity produced. Conventional combustion generating technologies create 25 pounds of pollutants for the same amount of electricity”. In addition to being a non-polluting energy source, fuel cells are highly efficient. While the electricity grid has an average efficiency of 30 percent, fuel cell systems achieve 40-50 percent fuel-to-electricity efficiency using hydrocarbon fuels such as natural gas (and up to 85 percent when the heat waste is used for cogeneration). Even greater efficiency gains occur in transportation solutions - fuel cell-powered vehicles are expected to be three times as efficient as the ones using internal combustion engines. Fuel cells are also a highly reliable energy source. They operate independently from the grid and do not require a particular weather condition, virtually eliminating the fear of losing power. Other benefits of fuel cells include fuel flexibility, ruggedness and durability, scalability, and compatibility with other electricity generating technologies. These benefits are attracting a growing number of companies, which turn to fuel cells to power corporate buildings and data centers, provide backup power to telecom towers, and run material handling equipment in warehouses. According to a recent report by the Breakthrough Technologies Institute, the list of Fortune 500 companies that utilize fuel cells include Adobe, Apple, AT&T, Baker Hughes, Bank of America, CenturyLink, Coca-Cola, CVS Caremark, eBay, FedEx, Google, JP Morgan Chase, Juniper Networks, Kellogg’s, Kimberly-Clark, Kroger, Lowe’s, Macy’s, Microsoft, Owens Corning, Procter & Gamble, Safeway, Staples, Sysco, Target, Urban Outfitters, United Natural Foods, Verizon, Wal-Mart, Whole Foods, Williams-Sonoma, Xilinx, and Yahoo!. Governmental institutions are also utilizing fuel cells as a means to save taxpayer dollars, improve air quality, and ensure reliable services. In addition to government buildings, wastewater treatment plants, and other municipal sites, fuel cells are beginning to make their way into public transportation systems. Fuel cell buses, which are electric vehicles power by fuel cells, are increasingly considered an attractive alternative. Early adopters include Oakland and Irvine, California; Cleveland, Ohio; Ithaca, New York; and Boston, Massachusetts. 1. Cost: With unique properties that perform outstandingly in fuel cell electrochemistry, platinum dominates the choice of material for this technology. According to a recent article published in the journal, Platinum Metals Review, this costly component can represent up to 17 percent the total cost of an 80 kW proton exchange membrane (PEM) fuel cells system using 2012 technology at mass production scale. Being a commodity, and therefore relatively insensitive to manufacturing volume, platinum’s scarcity represents a significant cost barrier to the widespread use of fuel cells. Hoping to overcome this challenge, manufacturers should turn towards innovative approaches that increase activity and utilization of current platinum group metal (PGM) and PGM-alloy catalysts, as well as non-PGM catalyst approaches for long-term applications. In this context, nanotechnology can be a strategic tool in enabling reductions in metal loading without a loss of performance or durability. 2. Performance: By enhancing cost-efficiency and enabling quicker returns to investment, the optimization of fuel cell performance could serve as a major incentive to wider adoption. According to the DOE, R&D efforts should focus on the following aspects: developing ion-exchange membrane electrolytes with enhanced efficiency and durability at reduced cost; improving membrane electrode assemblies (MEAs) through integration of state-of-the-art MEA components; developing transport models and in-situ and ex-situ experiments to provide data for model validation; and maintaining core activities on components, sub-systems, and systems specifically tailored for stationary and portable power applications. 3. Durability: An increase in the lifespan of fuel cell systems could also encourage more widespread adoption. R&D efforts aimed at enhancing the durability of fuel cell systems must understand the degradation mechanisms involved and create strategic processes to deter them. Examples of degrading conditions that compromise the chemical and mechanical stability of fuel cell systems’ materials and components can include impurities in the fuel and air, starting and stopping, freezing and thawing, and humidity and load cycles. According to Fuel Cells 2000, there are over a hundred U.S. colleges and universities that offer research and coursework in hydrogen and fuel cell technology. Located in 37 states and the District of Columbia, these institutions are a key force in advancing a wider adoption of fuel cell systems. Many of them carry out cutting-edge research efforts in partnership with the DOE and the Department of Defense. The following paragraphs offer a few examples of recent fuel cell innovation in the academic world. I. Cornell University: On March 10, a team of researchers from Cornell University reported the creation of a new thin film catalyst for use in fuel cells. They produced the first-ever epitaxial thin-film growth of Bi2Pt2O7 pyrochlore, which had previously been synthesized only as a nanocrystalline powder. The material is thought to be one of the most promising oxide catalysts for fuel cell applications and its synthetization as thin film could unveil new and exciting possibilities for fuel cell technology. II. University of Delaware and Columbia University: The most common way of obtaining hydrogen fuel is the steam methane reform process, which uses natural gas, requires significant energy, and generates carbon dioxide as a byproduct. A more sustainable alternative would be electrolysis, which consists of obtaining hydrogen from water. This process, however, requires a platinum catalyst that is too costly to use on large scale. Aiming to overcome this barrier, researchers at the University of Delaware and Columbia University have discovered a groundbreaking alternative: a combination of copper and titanium, two cheap and abundant elements, that imitates the structure of a platinum catalyst. Due to its inexpensiveness and efficiency, this innovative bi-metallic catalyst could revolutionize hydrogen fuel cell technology. III. University of New Mexico: In partnership with Japanese car manufacturer Daihatsu Motor Co. Ltd., researchers from the University of New Mexico (UNM) developed a technology that eliminates the need for precious metals, such as platinum, in fuel cells. It consists of an innovative, non-metal catalyst that relies on abundant elements, including iron, nitrogen, and carbon. The technology was chosen as a "Top 10 Innovation" at the first annual Innovation for Cool Earth Forum in Tokyo in October, 2014. As of December, 2015, Daihatsu had developed three demonstration vehicles with hydrogen fuel cells that use the UNM catalyst technology. IV. University of Michigan: Advances in hydrogen storage technology could pave the way for innovative uses of fuel cells, including market-ready hydrogen-powered vehicles. Researchers at the University of Michigan were recently awarded a $1.2 million DOE grant for a project that investigates man-made compounds, named metal-organic frameworks (MOFs), capable of storing hydrogen at high densities. If successful, this effort could develop MOF-filled tanks for hydrogen-powered vehicles. The ultimate goal is to develop a storage system that allows for driving ranges similar to the ones of gasoline-powered cars. V. Rice University: On April 16, scientists at Rice University reported the discovery of a cobalt-based thin film that works as a catalyst for the production of both hydrogen and oxygen. Used in the water-splitting process, the innovative film serves as both the anode and cathode of the electrolysis device, generating the two elements necessary to feed fuel cells. According to the researchers, the material is inexpensive, easy to make, scalable, and robust in both durability tests and in acidic and alkaline conditions. VI. Massachusetts Institute of Technology: Researchers MIT’s Laboratory for Energy and Microsystems Innovation (LEMI) are working on the development of microbial fuel cells capable of harvesting energy from wastewater. Different from chemical fuel cells that traditionally require costly metal catalysts, biological fuel cells use bacteria, which release electrons as a byproduct of respiration. LEMI’s scientists have investigated how the local environment affects the ability of bacterial cells to transform organic materials, sugars, and acetate into electricity. They aim to apply microbial fuel cell technology to wastewater treatment plants and have worked to overcome outstanding scalability obstacles. A growing number of companies are also engaging in R&D efforts aimed at advancing fuel cell technology. These corporate initiatives shed light on the tremendous potential for growth in the fuel cell market and unveil new and exciting applications of fuel cell systems. I. Ballard Power Systems, Inc.: One of the global leaders in PEM fuel cell technology, Canadian company Ballard designs and manufactures clean energy fuel cell products for a variety of applications, ranging from backup power to material handling. In 2014, Ballard invested over $14 million in research and product development. The company’s market focus is to “put fuel cells to work” both in commercial and development stage markets. Innovation has focused on fuel cell buses; continuous power for off-grid telecommunication sites and generator systems for off-grid homes in remote areas; and distributed generation systems, in which fuel cells generate clean energy right at the point of demand. With the objective of creating a cost-competitive commercial alternative to diesel and diesel hybrids in the transit bus market, Ballard has worked on the development of improved fuel cell modules for hybrid buses. Concrete goals include increasing the durability of the PEM, which would enable the extension of a module’s longevity to around 20,000 hours, comparable to diesel engines. The company recently unveiled its next-generation FCvelocity®-HD7 fuel cell module for buses, which features a reduced parts count – including fewer moving parts – an integrated air compressor and coolant pump, along with a reduced parasitic load. The solution went through an operation trial in Hamburg, Germany, in December 2014 and should soon be incorporated into zero-emission buses planned for deployment in Europe. On April 7, Ballard’s modules were used to power the world’s first hydrogen fuel cell-powered fixed rail electric tram, developed by Chinese rolling stock manufacturer CSR Qingdao Sifang Company. This innovative and exciting application sheds light on the unmatched adaptability of fuel cell systems. II. Bloom Energy: Founded in 2001, Sunnyvale, California-based Bloom Energy provides on-site power generation systems that utilize innovative solid oxide fuel cell (SOFC) technology with roots in NASA’s Mars program. Different from legacy fuel cell technologies, which require expensive materials and often fail to provide a strong enough economic value proposition, SOFCs use low cost ceramic materials and present extremely high electrical efficiencies, being able to deliver attractive economics without relying on combined heat and power schemes. Though very promising, SOFCs also pose major engineering challenges, particularly because of extremely high operating temperatures (typically above 800°C). With breakthroughs in materials science and design, Bloom has overcome these barriers and developed patented SOFC technology that is the basis for an innovative class of power generators, producing clean, reliable, and affordable electricity at the customer site. The company has raised over $1.2 billion in equity since its founding and, as of August 2014, had installed more than 130 megawatts of its units in the U.S. Its list of clients include Apple, eBay, FedEx, AT&T, Wal-Mart, Macy’s, Google, NASA, Verizon, Ikea, Staples, Coca-Cola, and CenturyLink. 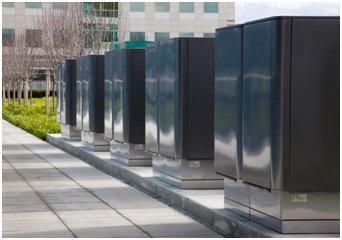 Bloom has been particularly successful as a provider of fuel cell systems for data centers and mission critical facilities, where energy consumption is a major cost and concern. The company’s modular, always-on architecture draws fuel from the highly reliable natural gas grid, and utilizes the electric grid as backup, thus eliminating the need for traditional backup equipment, such as diesel generators, UPS, batteries, and complex switchgear. By generating power on-site, the innovative system avoids 7-15 percent of losses from transmission across the grid and also prevents similar additional losses from duplicative UPS systems. III. Fuel Cell Energy, Inc.: Headquartered in Danbury, Connecticut, Fuel Cell Energy designs, manufactures, installs, operates, and services stationary fuel cell power plants. The so-called Direct FuelCell (DFC) plants have generated more than 3 billion kilowatt hours of ultra-clean electricity, equivalent to powering more than 245,000 average-size U.S. homes for one year. Fuel Cell Energy spent over $18 million in research and development in 2014. The company performs both public and privately funded R&D to expand the markets for DFC power plants, reduce costs, and increase its technology portfolio in complementary high-temperature fuel cell systems. Examples of ongoing research efforts include distributed hydrogen production, compression, and recovery solutions, particularly with the development of a gas separation technology denominated DFC-H2. The innovative mechanism captures hydrogen that is not used by the fuel cell electrical generation process, which can then be used for industrial and vehicle fueling applications. Fuel Cell Energy currently operates a tri-generation DFC300-H2 power plant at its Torrington, Connecticut manufacturing facility, utilizing natural gas to supply 1) electricity for the facility, 2) heat for the building, and 3) hydrogen for the manufacturing process, replacing hydrogen that was delivered by diesel truck. Supported by the DOE and the State of Connecticut, this innovative installation serves as a showcase for industrial users of hydrogen. The company is also engaged in carbon capture research. While the typical DFC application uses both natural gas and ambient air for power generation, the innovative carbon capture fuel cell solution uses the exhaust flue gas of a coal or gas-fired power plant to fully or partially replace the use of ambient air. The technology acts as a carbon purification membrane, transferring CO2 from the air stream (where it is very diluted) to the fuel exhaust stream, where it is more concentrated, allowing the CO2 to be easily and affordably removed for sequestration or industrial use. According to the company, the fuel cell carbon capture solution can destroy approximately 70 percent of coal and gas-fired plants’ smog-producing pollutants. IV. Plug Power, Inc.: Based in Latham, New York, Plug Power designs and manufactures fuel cell systems that replace conventional batteries in material handling equipment powered by electricity. The company’s innovative GenDrive fuel cells are productivity enhancing, lead-acid battery replacements for electric lift truck fleets. The drop-in solution provides continuous power at all times, even in freezer environments as low as -22°F. Different from batteries, GenDrive fuel cells never require charging or changing, which can save up to 13 minutes per shift (assuming that battery changing requires 15 minutes per shift compared to two minutes for hydrogen refueling). This reduction in vehicle and personnel downtime can increase productivity and lower operational costs. GenDrive fuel cells are also capable of maintaining constant power and full speed at all times, avoiding an average 14 percent decrease in speed, which happens in the last half of the battery charge. In addition, Plug Power’s solution makes large battery charging rooms obsolete, freeing up valuable warehouse space. Plug Power has created over seventy GenDrive products to fit different models of electric lift trucks from all leading global manufacturers. The company claims to be able to seamlessly convert the entirety of its clients’ fleets’ to hydrogen fuel cells. According to Nasdaq, revenues for Plug Power almost tripled over the past year. The first quarter of 2015 registered a 69 percent increase in relation to the same period of 2014. Plug’s innovative solution has attracted major companies, including Wal-Mart, Whole Foods, Kroger, P&G, Coca Cola, CVS, and BMW. With a myriad of potential applications and unique benefits, fuel cell systems could become a major element in our energy portfolio. Federal R&D tax credits are available to support the innovative efforts that will pave the way for a widespread adoption of this promising technology.